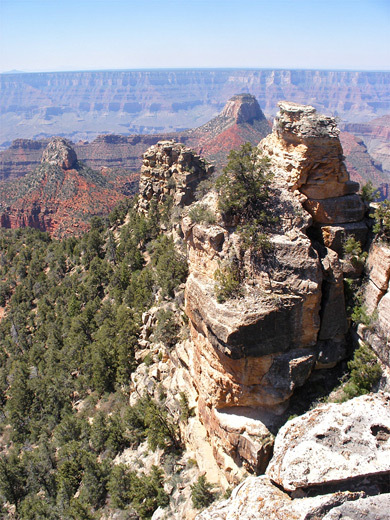 The western aspect of oft-visited Bright Angel Point is dominated by a short but deep and sheer-walled ravine known as The Transept, the far side of which can be seen along the Widforss Trail - a 5 mile, mostly level route that leads to a fine, if rather restricted, viewpoint at the edge of the North Rim plateau, above the head of Haunted Canyon. 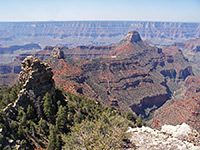 A better panorama can be had from Widforss Point, a narrow, wooded promontory half a mile southeast of the end of the trail, since from here much more of the Grand Canyon to the east is visible - the point itself prevents this being in view from the path. To reach the point entails scrambling off-trail across steep, bushy land for half a an hour, ending with a 200 foot climb to the open, rocky summit, but the effort is rewarded by a great vista over many square miles of the Grand Canyon. Grand Canyon from Widforss Point. From the end of the Widforss Trail at a small picnic area, the route to Widforss Point is down the pine-covered slope to the east, over a streambed, up and across the opposite hillside a little way before veering south into a slightly larger drainage, one that is filled by many spiky bushes growing close together. The far side of this slopes steeply upwards but is generally less overgrown, with pine trees at first then rocky outcrops as the canyon rim approaches. The promontory ends at several nice areas of flat limestone, lacking any trees to block the views; beyond here, the cliffs fall away vertically. The round trip hike to this remote but scenic spot adds about 90 minutes to the time needed for the Widforss Trail. From the viewpoint, the picnic spot at the end of the Widforss Trail can just be seen, in a clearing at the edge of the forest, shortly before the land starts to slope down steeply. The plateau continues for a mile or so west of here, as far as The Colonnade, a thin ridge that forms one side of Haunted Canyon, separating it from the next ravine west (Phantom Canyon). To the south, Widforss Point looks out over another long ridge of the Supai and Redwall layers, topped by the distinctive peaks of Manu Temple and Buddha Temple. 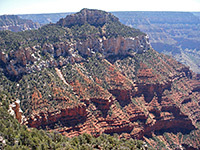 This ridge divides Haunted Canyon from the much larger drainage of Bright Angel Canyon and its tributaries, which occupy all of the land to the east; several miles of the lower canyon can be seen, as far north as the main visitor area at Bright Angel Point, though The Transept is obscured behind another red and white sandstone peak, Oza Butte. 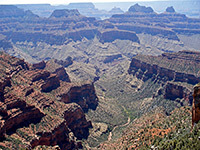 Some 10 miles of Grand Canyon's south rim are visible, from Yuma Point to Shoshone Point.